Robots have often been used as an educational tool in class to introduce kids to science and technology, disciplines that are affected by decreasing enrollments in universities. Consequently, many robotic kits are available off-the-shelf. Even though many of these platforms are easy to use, they focus on a classical top-down engineering approach. Additionally, they often require advanced programming skills. 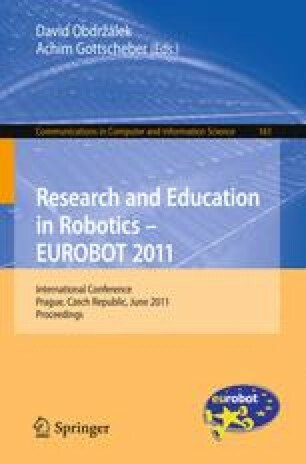 In this paper we introduce an open robotic kit for education (EmbedIT) which currently is under development. Unlike common robot kits EmbedIT enables students to access the technical world in a non-engineering focused way. Through a graphical user interface students can easily build and control robots. We believe that once fascination and a basic understanding of technology has been established, the barrier to learn more advanced topics such as programming and electronics is lowered. Further we describe the hardware and software of EmbedIT, the current state of implementation, and possible applications.